The Mike Benign Compulsion: German magazine Coolibri: "Thirteen lovely pop gems"
German magazine Coolibri: "Thirteen lovely pop gems"
Here's a late breaking review of "Here's How It Works" from Coolibri, an entertainment magazine that's widely distributed across Germany. Nice to see the album striking a chord overseas. And always good to see drummer Mike Koch getting some well-deserved love from the press. 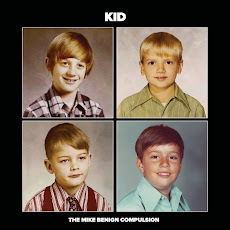 Old heroes never get rusty – like the Düsseldorf drummer Mike Koch, who has come out with a new album with his friends in The Mike Benign Compulsion: “Here’s How It Works” delivers thirteen lovely pop gems that are convincing whether slower in tempo (such as ‘Bay Window’) or uptempo (like ‘Professional Jealousy’). This LP has the effect of the antidepressant mentioned in one of the song titles: ‘Me And My Fluoxetine.’ This is how unpretentious Americana can sound. Truthers and Google Translate users can review the original online here and judge for themselves. Wann kommt ihr endlich nach Aschaffenburg?